Don’t love it? Don’t have to live with it! That tattoo probably seemed a great idea at the time, but what happens if you fall out of love with it? With lightning-fast laser tattoo removal treatments from Bodyvie, you no longer need to live with a tattoo you no longer love. Our advanced technology is clinically proven to remove tattoos with three powerful primary wavelengths. Bodyvie is excited to be one of only a few select clinics to offer the QUANTA Q-PLUS C EVO LASER, the most versatile multi-laser platform available with direct emission laser hand-pieces including: Q-Switched Platform (532nm), Nd:YAG (1064nm) & the world’s fastest Ruby (694nm) to safely remove tattoos of ANY colour and size quickly and efficiently. We treat any colour including more difficult red, blue and green pigment ranges. 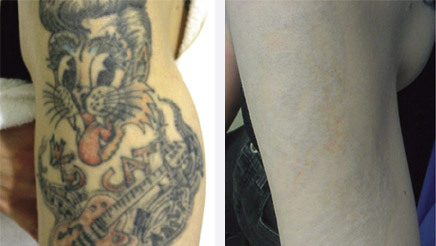 Even “ghosting” left over from old tattoos can be treated. No other device removes a greater range of tattoo pigments than the QUANTA Q-PLUS C EVO. QUANTA Q-PULSE C EVO LASER uniquely offers “optipulse mode” to increase energy emission by 50% to ensure treatments are faster, more effective and with enhanced comfort for patients. The Tri-wavelength technology means one of the fastest repetition intervals on the market, variable up to 10Hz. Additionally, the laser treatment head uses a patented OPTIBEAM® II technology to administer exceptionally precise coverage. Treatment times can be up to 20% shorter as a result. After a consultation with a Bodyvie Laser Specialist to discuss your requirements, we will initially conduct a patch test to ensure that the laser tattoo removal treatment will suit you. If there are no adverse effects after 48 hours, we can get to work on your treatment. During the treatment itself, your consultant will run the QUANTA Q-PLUS C EVO LASER device over your skin, emitting short, intense bursts of laser light that gets rapidly absorbed by the tattoo ink. This breaks up the pigment into smaller particles that can then be removed by the body’s natural filtering system. The tattoo will begin to exhibit a frosted appearance as the energy is absorbed. The treatment is quick and we can apply a local anaesthetic cream for increased comfort if you wish. Contact us today to book your laser tattoo removal consultation and take the first step towards renewed body confidence. We are able to treat any area of the body safely. The number of treatments needed to remove a tattoo completely will depend on the person and on the tattoo, so your consultant will advise you on a tailored treatment programme to suit you.